With its graceful curves and unique circular plates, the VIGO Aldous Wall Mount Bathroom Faucet creates a look that's both modern and space-saving in any contemporary bathroom. Constructed from solid brass and plated in VIGO's corrosion-resistant finishes, the faucet is as durable as it is beautiful. The single-handle bathroom faucet looks stunning installed above any sink for a show-stopping fixture in your bathroom. The VIGO Cornelius Wall Mount Bathroom Faucet features a dramatic trough-style waterfall spout and bold backplate for an altogether modern fixture that fits both traditional and transitional dicor. Constructed from solid brass, this single-handle wall mount bathroom faucet is as durable as it is functional. Also features a leak-resistant Sedal ceramic cartridge. 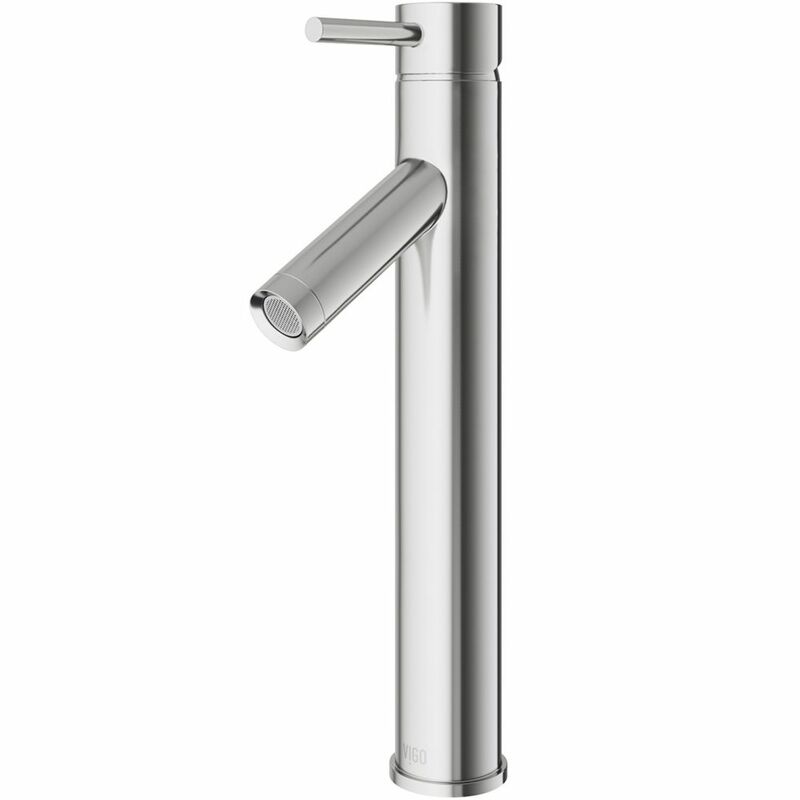 Dior Bathroom Vessel Faucet in Brushed Nickel Finish is rated 4.9 out of 5 by 42. Rated 5 out of 5 by Laurie from Canada from Vigo Dior Vessel Bathroom Faucet Chrome Beautifully packaged, easy to install and high quality for the price. So happy to have changed out my other faucet that was splashing out of the vessel sink, this faucet works beautifully for vessel sinks with no splashing. Rated 5 out of 5 by Wdavidkl from Beautiful Faucet Installed it two months ago. Just beautiful. Very contemporary and stylish for a modern bathroom. Installation was very easy, anyone can do it. I highly recommend it. Rated 4 out of 5 by CL from the faucet looks nice with my sink and fits in the narrow space on my vanity. the faucet looks nice with my sink and fits in the narrow space on my vanity. Rated 5 out of 5 by Vic v from Beautiful faucet The Vigo Dior is a beautiful faucet that compliments the vanity in my powder room perfectly. It's very good looking and functions well supplying plenty of water and able to hold water in the sink if needed. Highly recommended! Rated 5 out of 5 by star from Sink is absolutely gorgeous I was skeptical about how easy it would be to clean, but I personally have not had any issues getting even tough stains off of the sink and I have had it over a year! Rated 5 out of 5 by nbr1ses from Just Right! Bought this and the sink. They look great together! Works perfect and looks very good. Rated 5 out of 5 by Jeff4582 from Wonderful service! Very pleased with this faucet but had a slight slow-drip leak. Customer service (Carlton Stanton) promptly sent out a new replacement cartridge and all is perfect. VERY pleased not only with the product but also with the prompt and excellent service. Thank you!